This comfortable and charismatic apartment for five in Barcelona is located in the Poblenou area of the city, just steps from Plaça de les Glòries Catalanes and even closer to the Glòries metro station. This area of town is ideal for soaking up all the Catalonian culture from eating at lovely local restaurants to visiting attractions not too far away. What´s more, the beach is only a few stops on the public transport from this bright apartment. 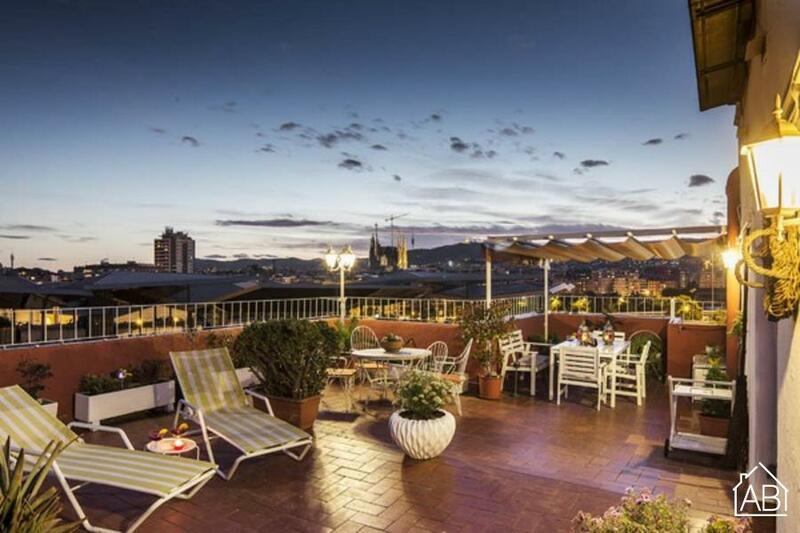 The apartment has a large private terrace from where you can enjoy a dinner al fresco with some of the most gorgeous views of Barcelona, from La Sagrada Familia to Montjuïc to the beaches, and so much more. With the apartment´s range of bright and bubbly to tranquil and soft colors, there´s always a place to chill out, what ever mood you´re in. Here there are 2 bedrooms, one with a double bed, the other with a single bed, and there is also a double sofa bed in the apartment. This accommodation sleeps up to five people comfortably in total. There is also a free Internet connection, a hairdryer, bed linen, towels, heating and air conditioning. The fully equipped kitchen is ideal for preparing your favorite Catalan dishes with a spectacular view (yes, from the kitchen!) when it´s a stay-at-home night. It comes with a microwave, a coffee maker, a toaster, an oven, a juicer, a kettle, pots and pans, a stove, a blender and utensils. This beautiful apartment has everything you need for a comfortable stay in Barcelona.